When the triangulation principle is used for navigation, AGVs are usually equipped with two different sensors: one for safety and one for navigation. The new RSL 400 safety laser scanner from Leuze electronic offers a true alternative: not only is it capable of handling the safety aspects, but it also provides all measurement values for the AGV’s navigation based on the natural-navigation principle. In addition to that, the measurement values have an extremely high angular resolution and accuracy. This is important to precisely determine the position of the AGV. This means that only one scanner is needed for safety AND navigation. Measurement value output of the RSL 400 is optimized for navigation software that functions according to the principle of natural navigation with SLAM (Simultaneous Localization and Mapping). With each revolution of its deflection unit, which last 40 milliseconds each, the safety laser scanner emits 2700 light pulses. These are scattered in all directions on obstacles. Parts of the scattered light are transmitted back to the scanner and used to calculate the distance to the obstacle. Similar to a map, the navigation software contains an image of the respective room, including all fixed boundaries. The current position of the AGV is then calculated by comparing the measurement values to the map. This concept is referred to as natural navigation. The more detailed and exact the measurement values of a scanner are, the more precisely the AGV can navigate. With an angular resolution of 0.1°, the RSL 400 can capture the environment in high detail over the entire measurement range up to 50 m. This is achieved through a particularly narrow laser spot that maintains its perpendicular shape over the entire scanning angle. It also reduces incorrect measurements, the likes of which can occur on edges. How far away is the obstacle? In addition to the angular resolution, the distance values are also important. With a typical error accuracy of < 30 mm, these are highly precise. In addition to that, the values are not affected by the reflectance of the object, whether it is a reflector or a black wall. The additional output of the received signal strength value for each beam allows autonomous detection of reflectors by the navigation software. When beams strike a reflector, the values differ greatly from any other environment. This makes simple and reliable detection possible. In addition to the navigation aspects, there is no lack of safety: the compact RSL 400 safety laser scanner offers up to 100 switchable protective and warning field pairs. Thanks to this high number, the protective fields can be adapted to the respective movement and load conditions as well as the speed of the vehicles in many different ways. And in 4-field mode with 50 switchable field sets, the device can monitor up to four protective fields simultaneously. This enables safe and reliable reduction of the speed of AGVs. With a scanning angle of 270°, the RSL 400 can also cover the front and side areas of AGVs at the same time, i.e., around the corner. 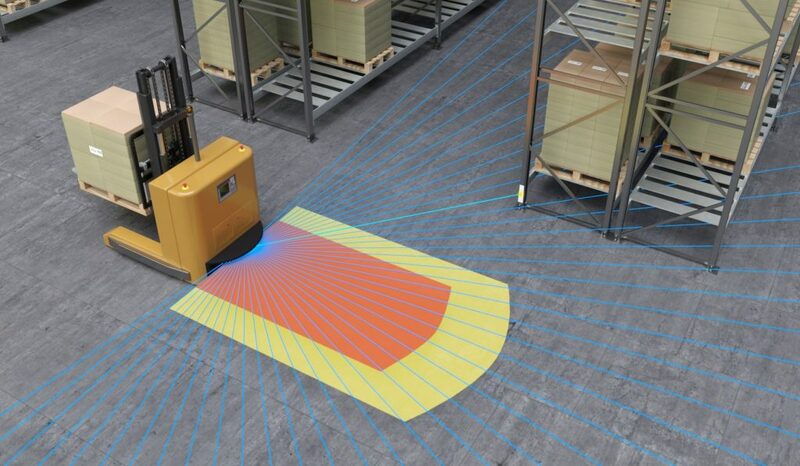 With these features and a maximum operating range of 8.25 meters, even large AGVs can be fully safeguarded with only two RSL 400. The safety laser scanner is available in various models. The product range includes nine functional variants, three of which with data output for AGV navigation. All variants are available for the four operating ranges of 3.0, 4.5, 6.25, and 8.25 meters. Models with PROFIsafe/PROFINET interfaces are also available. These interfaces make it much easier to integrate the devices, particularly when many different protective field configurations are used.